Camden Council plans to return Tottenham Court-Gower Street to 2-way working. News on latest plans, 1st May 2013. Camden’s LIP (local implementation plan) for 2011-14 announced that Tottenham Court Road (TCR) and Gower Street will revert to two-way working and that TCR southbound will be buses and cycles only. In summer 2011, LCC members voted for Going Dutch as a Campaign for the 2012 elections. Then at a meeting in August CCC members suggested that we should try to persuade Camden to Go Dutch in TCR. See an account of the meeting. David Arditti who proposed Going Dutch and who led our meeting wrote his ideas here. At a meeting in November 2011 we mentioned Going Dutch to Camden officers and they gave us their preliminary ideas for the scheme. Many ideas such as 20 mph limit and traffic reduction were good, but they proposed a median strip to allow pedestrians to cross at random. We were unhappy about medians strips, having encountered poor examples such as Pall Mall (previously a wide, one-way street, is now a two-way pinch point). We discussed how to Go Dutch in TCR at a meeting at LCC and then went on to the members December meeting for feedback. See maps and notes from the meeting. 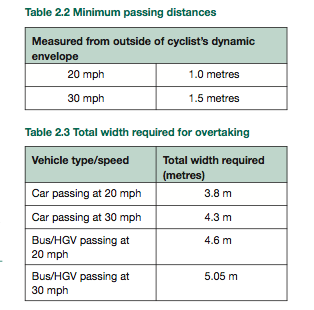 At this stage we were looking at 20 mph limit, traffic reduction and carriageway widths (e.g. 4.5 m) where cyclists could co-exist with motors. We were going against the idea of sharing a 3m bus lane southbound. At subsequent meetings with Camden officers in February and May 2012, we heard that they had been reading about Going Dutch. We agreed that comfort and safety for cyclists are the main criteria and that in general this would be achieved by separation in busy streets and by sharing in quieter ones; we noted that Exhibition Road is a bad example of Going Dutch because the Dutch would separate cyclists in such a busy road. Camden were thinking of widening the southbound bus + bike lane to 4.5m at bus stops. Further traffic reduction was discussed and we urged them to put a filter in Howland Street. By May, Brian Deegan had joined the TCR team. They proposed two-way cycling in most of the side streets (an big increase in permeability). They also proposed traffic calming by tables across lengths of the road (such as Bayley Street/ Percy Street junction to the Windmill Street/Store Street junction). And between Tottehnam Street and Torrington Place. The two carriageways now shown at 4.5 m.
We looked at LCC’s proposed Zone 1 cycling grid. We then combined it with some omissions and concluded that TCR would make a better addition to the grid than Gower Street in terms of spacing of north-south routes and connectivity. It is also an important destination in its own right. And it is on the intended alignment of LCN + Link 27 (CRISP Dec 2005, CCS). However we must not forget to provide a good cycling environment in Gower Street outside UCL/UCLH which would not necessarily get Dutch-style treatment, but would at least benefit from two-way traffic, which would make it a little more liveable and permeable. TCR between Torrington Place and Howland Street : Our cycle counts on the Seven Stations Route (SSL) in September 2011 8:30-9:30 am showed over 700 cyclists between Torrington Place and Howland Street with more than 500 turning into Howland Street. See map with counts and see calculations. To support this route whose usage continues to expand, we would like to reduce the number of motor vehicles on this stretch of TCR and in Howland Street. This westbound route involves two junctions that require attention (Torrington Place/TCR and TCR/Howland Street). At the latter, cyclists going straight ahead on TCR risk ‘left look’ . The CRISP Report for the SSL (Link 30, Feb 2009, CCS) recommends a point closure at the junction of TCR and Howland Street (we now prefer a closure in Howland Street). New Oxford Street and Charing Cross Road north of Cambridge circus: TfL’s Route 38 bus consultation in 2005 proposed that these streets would to be accessible only to buses, service vehicles and cycles in both directions. Endell Street: Cyclists who turn right at the junction Bloomsbury Street/High Holborn, heading for Shaftesbury Avenue are at risk of ‘left look’ from vehicles turning left into Endell Street. We therefore request that motor vehicles are excluded from this manoeuvre. Shaftesbury Avenue north of High Holborn: we had seen an undated proposal from Space Syntax to close Shaftesbury Avenue to motor vehicles between High Holborn and New Oxford Street. We support this idea and think that it could provide a pleasant cycle and pedestrian route from Princes Circus to the British Museum. To complete this for cyclists, we would need northbound contraflow cycling in Coptic Street. This is a very useful general principle which we would like to have followed throughout the design. But some are of outstanding importance: Gower Place and the eastern end of Grafton Way as part of a route parallel and close to Euston Road (no buses on Grafton Way after changes at Euston Circus); Huntley Street as part of an alternative link in the SSL; Coptic Street to link Shaftesbury Avenue to British Museum; Tottenham Street as a link into Fitzrovia (and should be incorporated into the redevelopment of Whitfield Gardens); complete Store Street – Kepple Street as an intermediate eastbound route between Torrington Place and Bayley Street; Great Russell Street for access to British Museum. We were already realising the weakness of a proposal for loading bays outside cycle tracks: when they are on the footway, the space is available for use by pedestrians during the many hours when loading isn’t taking place. But we were unable to think how to get delivery vehicles across the cycle track. The Mayors’s Vision for Cycling in London was published in March 2013. We noted that from pages 9 and 10, it is clear that TCR is to be an important link in the Central London Grid. We tried to work out what the vision has to say about segregation and the issue of contention between cyclists and buses. For Cycle Superhighways (CSs), the vision states : “we will segregate where possible”. It also says that island (or floating) bus stops (with cycles on the inside) will be used in wider roads, as for example on CS2 extension through Stratford. However as Andrew Gilligan said at or meeting in April, at places with crowds of pedestrians and numerous bus services, island bus stops may disadvantage bus passengers who have to cross the cycle track. Camden Council made a set of CAD drawings to assess the validity of our proposal. The first drawing deals with the stretch between Torrington Place and Howland Street (where we most wanted separation for cyclists): they would need to have a bus stop on the west side opposite a loading bay, requiring 2.2 m more width than available in the road. Due to trees the wider western footway can’t be narrowed, so the eastern footway would need to be reduced to 2m. A second drawing for the stretch between Howland Street and Maple Street with bus stop on the east side of the road has the same problem. A third drawing covers University Street to Grafton Way: here there is no bus stop and the carriageway is 14 m wide but officers say a median strip is required to enable pedestrians to stop on the way across, so a metre or so of footway would be lost. The fourth drawing is for Grafton Way to Beaumont Place where northbound traffic will increase due to traffic transferring from Gower Street. It includes the bus stop outside Warren Street station where bus routes 14, 24, 29 and 134 all stop and large numbers of passengers get on and off the 40 or so buses per hour at busy times. The potential contention between passengers at bus stops and cyclists on the track convinced us that even in this wider part of TCR, the island bus stops would not be fair to bus passengers. There has been extensive discussion of this issue on the lcc-issues mailing list and the jury is still out as to conditions when island bus stops could work. The fifth (and last) drawing shows the section of TCR approaching to Euston Circus. We noted to Camden officers that we are concerned about the treatment of TCR on the approach to Euston Circus because of our proposals for that junction. Entry southbound will be for buses and cycles only and should be in a lane 4.5 m wide. Northbound depends on whether TfL decides to implement our proposal (called Option 6 by TfL). 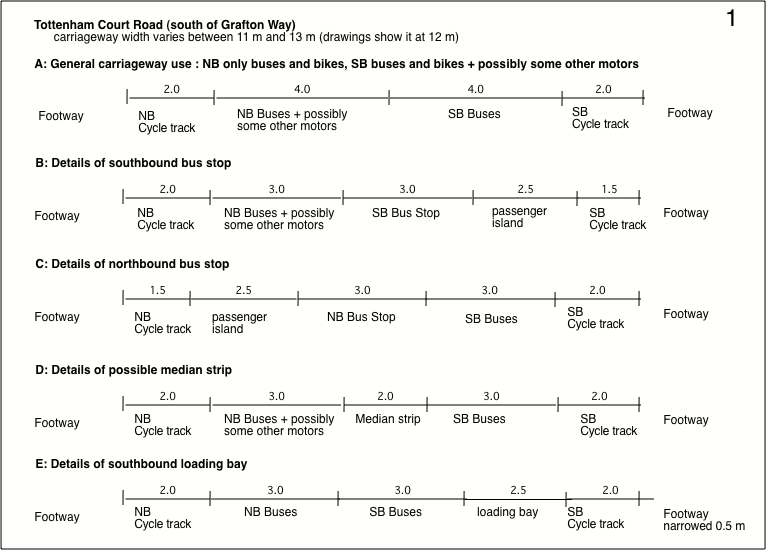 With Option 6, bus + cycle will have a separate signal and need a separated 4.5 m shared lane. The DfT Cycle Infrastructure Design LTN 2/08 recommends (left) that for buses and bikes to coexist safely in a 20 mph road, the lanes should be at least 4.6 m wide to allow a passing distance of 1.0 m. Within this width, buses can overtake cycles and cycles can overtake buses, for example, at stops. But motor vehicles (apart from motor cycles) can’t overtake one another without using the lane going the other way. A total road width of 9 m will allow widening of footways for most of TCR (apart from the narrow section at the southern end). No parking will be allowed and loading will take place on bays on the footway, probably at limited times. Camden has considered a variety of options for traffic reduction. They favour an arrangement in which only buses and cycles can enter the road at the northern and southern ends with limited access for loading. Under this option, private motor vehicles will be allowed to enter and leave TCR from the side streets. Camden intends to use the same treatment in Gower Street and New Oxford Street. Permeability for cyclists will be increased into the ladder of side streets: I haven’t counted, but they tell us that the number of streets with two-way cycling will increase from 7 to 22. The Seven Stations route is a concern because it has the characteristics of a ‘quiet way’ in Torrington Place and then emerges into TCR without protection. It would be worth considering a quiet alternative via Huntley and Capper streets. We are continuing to press for the use of a closure in Howland Street (e.g west of Fitzroy Street) to prevent rat-running on the Seven Stations route, including via Grafton Way. We have concluded that we will support the Camden proposal. However, we feel that it will not do much to encourage new people to cycle, although the increase of permeability will allow those that want to to escape via the side streets. But being able to escape isn’t really the main function of a cycling street, particularly one that is likely to be part of the new Central London Cycle Grid. Regarding the area around Princes Circus: Princes’ Circus is the triangular area bounded by Shaftesbury Avenue, High Holborn and Bloomsbury Street. Camden’s plan is to close one of the two traffic routes currently existing between Shaftesbury Avenue and Bloomsbury Street in order to create a large and congenial pedestrian space there. The version we saw at a workshop on 29th April failed to show cycle access across this. We made the case again that the plan should include cycle access allowing two-way cycle flow on both alignments (between Shaftesbury Avenue and bottom portion of Bloomsbury Street).